Bear-Patrol raised a total of £716.61 for the Rainbow Fund over the Pride weekend. The money was raised at the Bear-Patrol pre-Pride Quiz at the Camelford Arms on August 3 (special thanks to the Co-Op Funeral Care who donated the wonderful hamper prize) which was won by the Fantastic Foreskins; and bucket collections at the suited and booted Sunday Lunch at Brighton Marina Yacht Club on July 23; Miss Jason’s Pride Breakfast at the Brighton Hotel on August 5, The Bedford Tavern on August 6, and the Queens Arms on August 6. 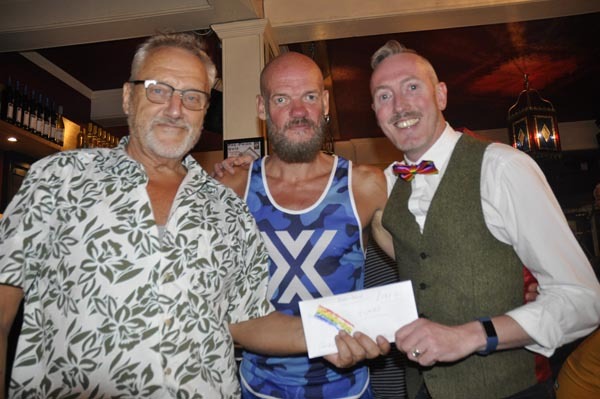 Chris Gull, Chair of the Rainbow Fund, said: “The Rainbow Fund is once again impressed and delighted that Brighton Bear Weekend raised so much, and that they have entrusted us with making sure that the money raised is put to the best possible use in supporting projects which benefit our local LGBT+ and HIV organisations. “We thank them, on behalf of all those people, for the months of planning, and days and nights of hard work, which delivered such a successful weekend and fantastic total. The Rainbow Fund make grants to LGBT/HIV organisations who deliver effective front line services to LGBT+ people in the city. Brighton Bear Weekend 2018, will run from Thursday, June 14 – Sunday, June 17. Mark your diaries now!